Sir Robert Peel, the founder of the modern Conservative Party, was born on 5th February 1788. 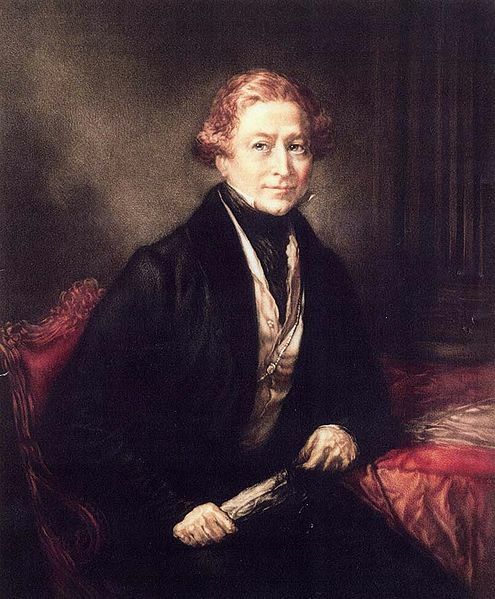 Robert Peel was born at Bury in Lancashire but grew up at Drayton Manor near Tamworth in Staffordshire. This is known today as the site of a popular theme park, although the original house no longer exists. The estate was bought by Robert Peel’s father who had made a fortune in the textiles industry and used his money to buy his way into the social and political establishment. Robert Peel benefitted from his father’s endeavours in several ways, not only inheriting his baronetcy in 1830 (hence the title Sir Robert Peel) but gaining an expensive education and his first seat in Parliament via a “pocket” Irish borough. However, although his career was launched by family money and influence, Peel was undoubtedly a brilliant man (he gained a “double first” at Oxford) and a natural Parliamentarian. He became Home Secretary in 1822 at the age of 34 and made a number of important and lasting reforms. These included reducing the number of offences that carried the death penalty and instituting a properly regulated police force for London. This latter initiative, which became the pattern for policing in many parts of the world as well as the whole of Great Britain, led to policemen becoming known as “bobbies” or “peelers” in his honour. It was in 1834, in his “Tamworth Manifesto” that Peel laid down the general principles that underlie modern Conservatism. In effect, these liberalised the hard-line approach of the old Tory party that was based on aristocratic rule funded by “old money”. Peel represented a new class, namely that of people who had achieved success by their own efforts – albeit one generation removed in Peel’s own case. The basic tenet of the new Conservatism would be that change would be embraced when it was the best thing to do, but would not be undertaken merely for the sake of so doing. Peel became Prime Minister of a minority administration in 1835, but it did last long due to the opposition parties ganging up to defeat most of his proposed measures. Peel’s main stint as Prime Minister began in 1841 and lasted until 1846. The outstanding success of this government was the Factory Act of 1844 which, among other things, restricted the hours that children could be made to work in factories. The idea that children as young as nine could still be forced to do dangerous work in cotton mills for nine hours a day might strike us today as barbaric, but it was a distinct improvement on what had gone before. However, it was the repeal of the Corn Laws that showed Peel at his most courageous, because he knew that repeal was essential but would put his own political future in jeopardy. The Corn Laws were import tariffs that kept the price of imported corn artificially high and caused real distress to ordinary people who could not afford to buy enough bread to prevent hunger. This was especially true of Britain’s Irish subjects who had suffered the devastation of potato blight in the 1840s. Peel eventually got the repeal through Parliament, but at the expense of splitting his party, which divided between “old Tory” and “new Conservative”, the latter being generally known at the time as “Peelites”. Peel was forced to resign as Prime Minister in June 1846. Sir Robert Peel died in June 1850 at the age of 62, following a fall from his horse in central London. He is remembered as one of the great peacetime Prime Ministers and also as one of the most influential.